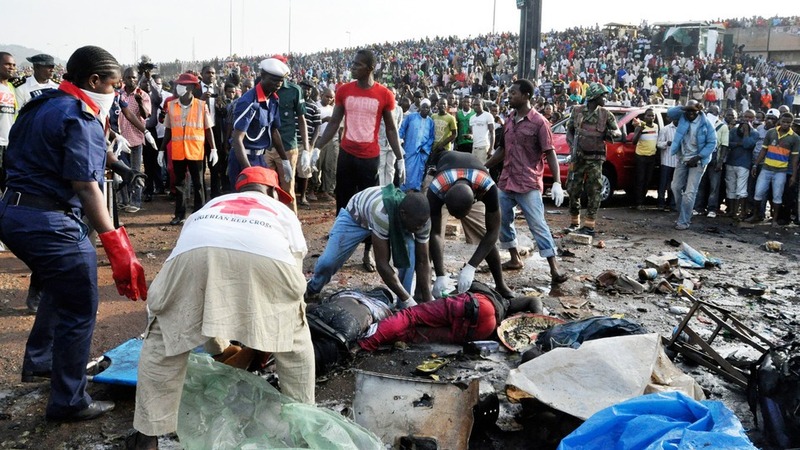 JNN 11 Nov 2014 Abuja : A suicide bombing claimed at least 20 lives in northern Nigeria on Monday in the Ashura Procession , held to Mark the Martyrdom Anniversary of the 3rd Leader in the Chain of Leadership of the Shia Muslim . The bloodshed took place during the Religious procession taken out to mark the Ashura in the town of Potiskum in Yobe state. While no group has claimed responsibility, But it is quite evident from the chain of events , that Boko Haram , which is an Wahabi funded and sponsored Organization , and Promotes sectarian hatred , and trains and tames Innocent People for Suicide attacks and are also Blood thirsty of specially the Shia Community , Boko Haram, is a Terrorist Organisation affiliated to al-Qaeda. Religious violence is common in Nigeria, But Now as the Organizations like Boko Haram has gained strength , which is a Wahabi aligned Terrorist Organisation , clearly suggest their Involvement in the Ashura Massacare. The bombing on Monday suggests that Wahabi Ideology has strengthened its roots in the country , and thus sectarianism is being fanned , by creating rivalry between Sunni and Shia Sects of Islam to create another factor in the country’s unrest. Boko Haram, The Wahabi Ideology , considers members of all the others sects except themselves Infidels and thus are Liable to be Killed . The bomber joined the procession before detonating his device in the middle of the crowd, killing at least 20 people. “I heard a very heavy explosion as if it happened in my room. It took place just 200 metres from my house,” said Yusuf Abdullahi, an eyewitness, according to Reuters news agency. The Event of Ashura marks the anniversary of the Martyrdom of Imam Hussein a.s , a grandson of the Prophet Mohammed PBUH, at the Battle of Karbala in 680 AD. Commemorations of this occasion have often been targeted for attack in Iraq, Afghanistan and Pakistan. Boko Haram’s campaign to impose its brand of Wahabi fundamentalism on Nigeria has claimed at least 2,000 lives this year alone. Elsewhere, the movement is believed to have organised a prison break in Kogi state which freed 132 inmates. The same jail was attacked by Boko Haram in 2012. Kogi state is found in central Nigeria, hundreds of miles away from Boko Haram’s heartland in the north. The prison break shows how the armed group’s tentacles have stretched across the country. Many of Boko Haram’s fighters are thought to have been held in this particular jail. Some will have been freed in Monday’s raid. This entry was posted in AFRICA and tagged Africa, Ashura Processsion, Boko Haram, Nigeria, Shia News, Wahabi. Bookmark the permalink.